Lehigh University. 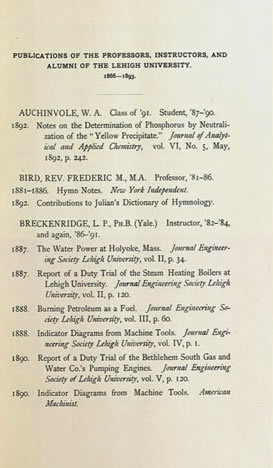 Publications of the Professors, Instructors, and Alumni of the Lehigh University, 1866-1893. South Bethlehem (Pa.), 1893. This booklet was published to be a part of the exhibit of the Lehigh University at the World's Columbian Exposition that took place in Chicago to celebrate the 400th anniversary of Columbus' arrival to the New World. It contains the list of publications by Lehigh University students, faculty and alumni from 1866 to 1893. 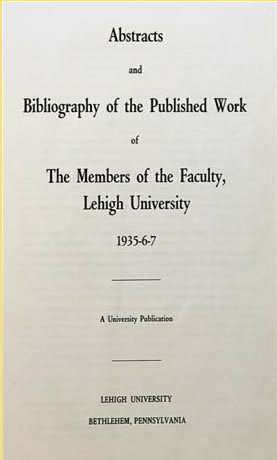 Abstracts and Bibliography of the Published Work of the Members of the Faculty, Lehigh University, 1935-6-7. (Circular / Lehigh University. Institute of Research; no. 136.) Bethlehem (Pa.), 1938.